Warhammer 40,000 - I miss being able to play 40K 2-3 times a week. Back when I could play more often I think I was either significantly better or my opponents were significantly worse. Regardless I was glad to take some of my toys for a spin on the new terrain set I've been working on to make sure it's functional before I finish painting up this set of mining company terrain. I'll post about it's construction at a later date as I need to make a few more pieces to fill out the table. 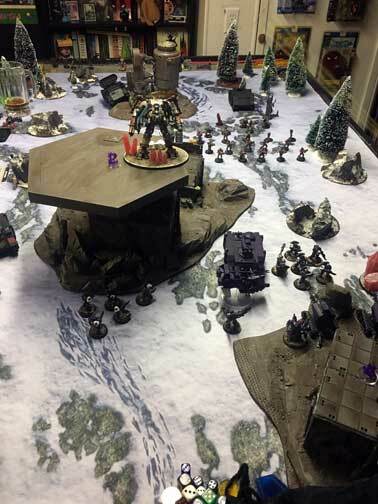 This week I took a 1500 point list that has a 750 point CAD that I wanted to test out for a team event that is happing at Imperium Games in Wixom on May 20th. Check out their facebook page for more details. If current rumors are true it might be the last seventh edition event in the area. We rolled up the increasing card mission of the Maelstrom of War table and got the football field deployment zones. I should get a few turns to drop shells on the sisters as they advance right? All I needed to do was steal the initiative. The single pip showing on my die will foreshadow how the rest of this game is going to go. 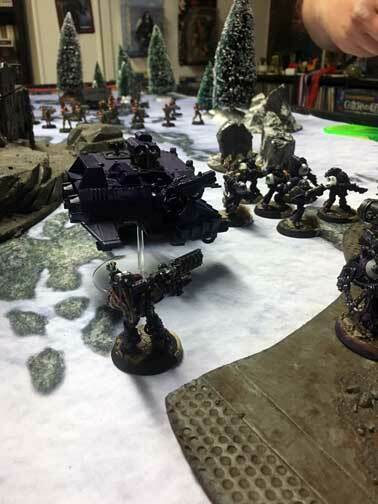 The Dreadnights teleport right in front of my lines and mock me as I fail to take one down even after concentrating all my firepower on the Dreadknight looming above my massed artillery. 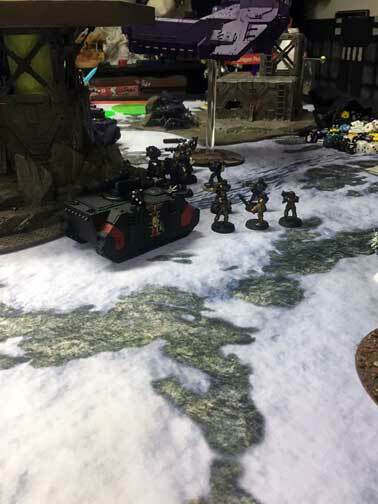 The single techmarine gunner left manning the batteries bravely stood toe-to-toe with the menacing Dreadknight for several turns waiting for the air support to arrive. Which when the Fire Raptor and Caestus Ram did finally arrive they couldn't pierce the invulnerable saves of the space nuns. The horde of them tactfully took out each unit I sent forward with a hail of bolter fire. In addition to the massacre that was happening on the tabletop the mission cards also sought to foil my plans. I scored a single point by eliminating a unit in the shooting phase. Compared to the 16 points my opponent scored I look like a fresh faced noob. Luckily the game was quite enjoyable and I really liked seeing a Sisters army run so efficiently. It would have been nice to se the thuderfires shoot once but knowing they can be taken out so easily was a good lesson to learn.